“Strongwoman” sees a boy dealing with the aftermath of the divorce of his parents and the entry into his mother’s life of a new friend, a competitive bodybuilder who is unlike any woman our narrator has ever encountered. 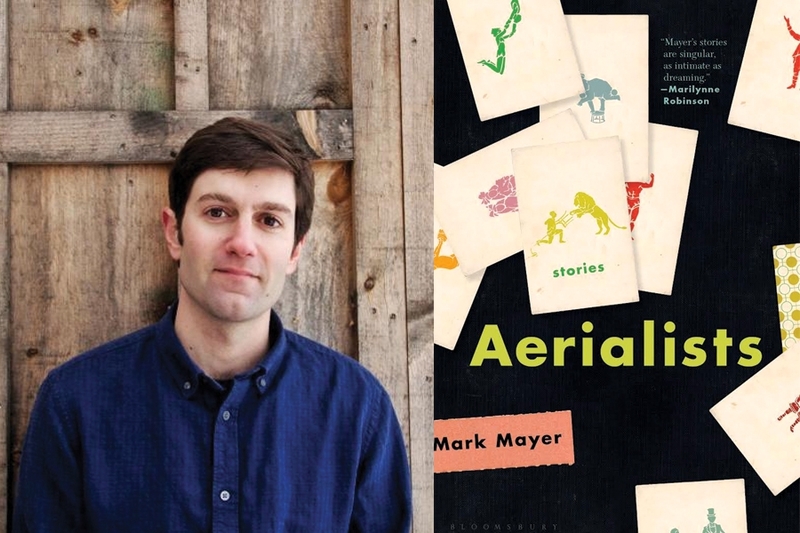 Title story “Aerialists” features a young man struggling to come to terms with growing up; his work assisting a blind neighbor leads to the idea that intimate expression can take many forms. And “The Evasive Magnolio” is a heartbreaking story of a peach farmer’s discovery that his longtime elephant companion has died. When he seeks out help with the burial, he learns that the nearby town has also faded away, leaving him with just one horrible option. Perhaps the weirdest story of the bunch is “Twin,” where a teenaged girl recounts her former best friendship with another girl, a once-conjoined twin who was left locked-in by the separation process. The two share a psychic bond, but even the most special of childhood friendships can eventually fade away. “The Wilderness Act” is the story of a man’s misguided quest for love as he desperately seeks someone with whom to genuinely connect. But even when he finds someone – through questionable pretenses – he can’t fully realize the desired dynamic. In “The April Thief,” a boy slowly comes to the realization that sometimes, what our parents tell us isn’t the truth – or at least not the whole truth. And in his yearning for a reckoning, he winds up upending the rest of his life, too. “Solidarity Forever” offers the story of a brilliant, damaged man on a Quixotic quest to prove the merits of communism through math. His efforts lead to him eschewing meals and lingering in the basement, much to the dismay of his wife and their young nephew who lives with them; the nephew in particular seeks solace in whatever patterns he can find in the world. “The Clown” can best be summarized by its opening line – “The clown counted his murders as he drove the new couple to the house on Rocking Horse Lane.” Really, you don’t need anything more – it’s the story of a murder clown. Last but not least, “The Ringmaster,” a touching tale of a retiree’s effort to find a good home for his massive train set, a lifelong project that he deeply wishes would somehow live on beyond him. None of these brief summaries do these stories justice (well, the one for “The Clown” comes pretty close); each one of these pieces is thorough and thoughtful, presenting complex narratives that defy simple synopsis. Individually, they shine. Taken together, they paint an emotionally impactful picture packed with dark jokes and glimmers of hope … only the jokes can hurt and the glimmers are sometimes extinguished. Mayer has a distinct authorial voice that permeates the work; too often, collections like this one feel too uniform in their sound. That’s far from the case here – even the stories that seem as though there might be overlap are distinct. The characters that populate these pages are challenging and flawed, driven by desire and as subject to poor decision-making as the rest of us. “Aerialists” renders the weird mundane and the mundane weird, finding commonality in strangeness while accentuating the bizarreness of the everyday. In that way, it truly does evoke the circus – it’s three rings of the unknown reflecting the personal truths we keep buried within.